All roads in the West of England led to Plymouth. Cars, char-a-bancs, buses streamed in a continuous procession for hours. The railway trains were crowded. People came in great numbers all the morning. Tickets were booked as far away as Bristol. The Cornish trains especially were packed. But a great proportion of the population of Cornwall seems to have set out early in the morning by road. At ten o'clock there was a queue of cars and other vehicles at Torpoint stretching from the ferry back into Fore Street, which increased from that time onwards. The ferry service was speeded up. The huge boats ran across and back, regardless of the time-table, as fast as they could take on and disgorge their load till after one o'clock. There were signs of an intensified bustle in the City, but the fact that the traffic did not appear to be much greater than usual was accounted for by the determination of spectators to be early on the ground. The first queue outside the turnstiles was formed at half-past seven in the morning, By nine o'clock this had grown to a small crowd. By half-past eleven Home Park was besieged, and the authorities determined to open the gates 20 minutes before the time announced. So that, as the hour for the beginning of the match drew on, the ground, which seemed to be quite full, was receiving only a trickle of the 44,500 people who eventually saw the match. There were then 1,800 cars in the car park. At the finish it took an hour and a half to get them away. Among the people in the Grand-Stand were many distinguished visitors. They included Lord Mildmay of Flete, the Lord-Lieutenant of Devon, the Earl and Countess of Mount Edgcumbe, Mr. Isaac Foot, M.P., the Mayor and Mayoress of Plymouth, and many other personages well-known in the West. No such crowd has ever been assembled at Plymouth before to see a football match. The total was eight thousand more than the ground had previously held, and the gate-money, amounting to �3,205, was easily a record. Ninety-eight people made the all-night journey from Huddersfield. but not all of them went to the match. A few ladies with the party were so impressed by Plymouth when they arrived that they decided to spend the afternoon in the shopping streets and on the Hoe! Although there were 44,500 spectators the ground was not quite full. The previous record attendance was 36,631 at a match two years ago, but since then the banks have been raised and terraced, and possibly, with judicious packing, accommodation could now be found for 50,000. An example of the enthusiasm for the match can he gauged from the fact that a record number of Dockyard employees left work at eleven o'clock and thus willingly forfeited an hour's pay in order to be in their places early. Even amongst such a huge crowd there was not much boisterous enthusiasm before the game, though a riotous welcome was given by those in the stand to one perfectly gorgeous figure � the vicar of a parish some miles from Plymouth, who wore a cricket sweater beneath his clerical coat, and a black "topper" generously bedecked with green, the outfit being made complete with a couple of rattles! There were the usual witticisms from the crowd. Before the start one particularly tall policeman was told by a wag that unless he sat down when the game started he would be on "nights� when the next round tie was played. Half an hour before the start the Huddersfield players, many wearing bowler hats, inspected the pitch, and one spectator wanted to know whether they were footballers or commercial travellers. Later, after some very high kicking by the backs, one man wanted to know if there was "any snow on the ball yet!� And during the second half, after the result of the "Penny-on-the-ball� competition had been announced, the winner, a Brixham man, after a lusty clearance by Roberts, the Argyle captain, loudly reminded him that he wanted it for his front-room mantelpiece! It is probably safe to assume that there were people present from every town and village in Devon and Cornwall. One of them was an old gentleman aged 89, Mr. S, Warwick, who had made the journey from Truro. He was accommodated with a seat in the Press box. There was a great cheer just before the start when a green and black balloon, about five feet high, with a horseshoe attached, went up from the ground. On it were the words �Come on, Argyle. Going up to the First Division? Cheerio everybody." It would be interesting to know how far it travelled. It headed in a north-easterly direction. "Twill be just about getting to Huddersfield in time for the replay on Wednesday,� said a Yorkshireman. Tribute should be paid to the excellent arrangements for accommodating the crowd. 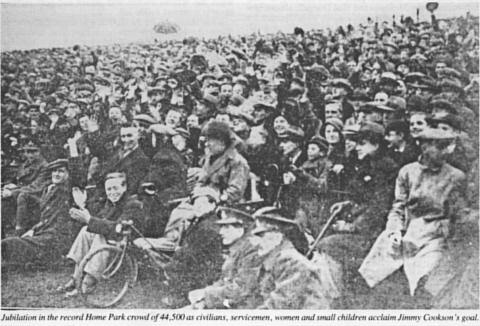 Perfect organisation had ensured that there was not the slightest hitch among reserved seat holders, and about one hundred voluntary stewards, drawn from the Argyle Supporters� Club and the Devon County Football Association, assisted with the expeditious packing of the crowd on the terraces. But the arrangements in the car park were far from satisfactory. The park itself was full, and there was an �overflow� on closely-adjacent land. But only one exit was used after the game, with the result that cars were still leaving an hour and a half after the game was over. With a little foresight this irritation could have been overcome, by using two or even three exits. There were thrills galore for the huge crowd between 2.30 and 4.10 p.m., with two highlights � the thunderous booming cheering that must have been heard miles away when Cookson scored for Argyle after 20 minutes' play, and that dramatic equalising goal for Huddersfield when the game had only 90 seconds left to run. That was the staggering anti-climax, which reduced the crowd to stony silence, and a few moments afterwards they were wending their way slowly homewards in a funereal atmosphere. 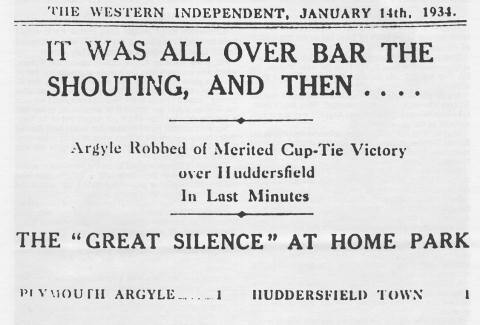 At the end of twenty minutes came the blow that shattered all the vaunted superiority of Huddersfield, and set Argyle on the path that looked like ending in a gallant victory. During some frantic work in defence Huddersfield had conceded a corner, and the free kick sent in by Roberts was returned to the feet of Mackay. Instead of sending it back direct, Mackay easily tricked Young, took the ball a trifle forward, and then delivered a correct pass to the forwards. Cookson was on it in a flash, and with a first-time shot drove the ball into the net. Then came the score just two minutes before the end, which allowed Huddersfield to fight another day. It was all very surprising. Watches were out, and shouts were being held to mark the wonderful victory. The ball was away on the right of the Argyle goal when Bott received it, cut in, and then sent the ball across the Argyle goal. The other forwards rushed in, and McLean managed to get to the ball only a yard or two from the goal-line, and he sent it past Harper. It was all most disheartening, but the fact remained that Huddersfield had effected a draw when it appeared a thousand to one that they would be defeated. Huddersfield - Turner; Goodall, Roughton, Carr, Young, Campbell, W. Smith, McLean, J. Smith, Lake, Bott. Argyle - Harper; Roberts, Rae, Mackay, McKenzie, Gorman, Grozier, Melaniphy, Cookson, Briggs, Black. Scorers: Argyle - Cookson; Huddersfield � McLean. Referee: Mr. S. F. Rons (Watford). � Argyle lost the replay 6-2.